All of my tidbits, updates, opinions, and random thoughts since my last "Around The Homestead." I reckon my happiest news (to me anyway) is that Critter Tales made The North Country Farmer's list of "The Best Homesteading Articles and Books of 2015." This is a really great list with a lot of good resources referenced, and I'm honored to be on it. Do check it out. Just between you and me, making this list offsets my disappointment that Amazon opted not to discount it. (Apparently this is a trend at Amazon, as reflected by comments at the CreateSpace author forum.) 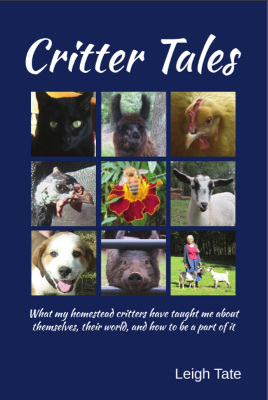 I had hoped for a good discount, because since Critter Tales has 125 more pages of information than 5 Acres & A Dream The Book, it is more expensive to produce. As it was, I took lower royalties to make it as affordable as possible. Reviews coming in on Amazon are really encouraging and if you've written one, thank you, thank you! Readers' opinions are much more convincing than anything I could tell folks about the research, stories, and conclusions about critters that I write about. If you've read Critter Tales and are willing to do a review on your blog or website, I'd be very grateful. I'd like to start a "What Readers Are Saying" page and will link it to you. these days. Apparently sharing the chicken yard is okay, just not the coop. Due to territorial disputes over the chicken coop, the Muscovies moved out and into the pecan tree. The unfortunate consequence of that is that our drake disappeared. I went out one morning to do chores and he was nowhere to be seen. There were no remains to be found and we suspect an owl. Now I need to get another flock husband for my ladies. had a white spotted and speckled egg before. I'm getting about 6 or 7 eggs per day now from 10 first-year Australorps, my 2 old Speckled Sussex, and my elderly Buff Orpington. None from the ducks yet, although I think they'll need they're own nest boxes for that. Those are on The List! Early morning shot of Honeysuckle Hive. No activity from Honeysuckle hive, although none is expected this time of year. I've noticed that when the winter winds blow, the bushes in the shelter of the fence are still, while everything else is whipping around like crazy. That means my bees get shelter from those fierce cold winds too. I'm thinking maybe I should clear more along this fence for my next two hives. Once the weather turned a proper cold, we did the deed and processed our two young pigs. I'm still working on pork and hope to have some blog posts about that in the future. More piglets are on the way. Also more goats on the way! Kidding starts at the end of next month, with most of my girls due in April. Caulking is still in progress, but first coats of paint and primer are applied. The temperatures have mostly been too cold to finish the exterior caulking, priming, and painting, but on occasion we get a day warm enough to make some progress. I have to say that getting these in the dining room along with better insulation has made a wonderful difference inside the house. Our wood heat is much more efficient now, and even with nighttime temps dropping into the teens, the front part of the house is still above 60 in the morning. The kitchen is the exception, because it is at the other end of the house from the wood stove. A quick fire in the cookstove gets things warmed up. There's an interesting discussion at my 5 Acres & A Dream The Book facebook page about the contrast between different philosophies of marketing. Click on over if you're interested and have an opinion, or come back here to leave a comment. I'd be interested in what you think. My next post will be the much anticipated results of my baking with wood ash experiments! Oh, Leigh! The windows are so beautifully highlighted by the paint colors! I love that we are both processing meat at the same time! More venison sausage last night. Our bees are out in the open. My hive master says that it makes his hives stronger to raise bees that either survive or die without protection. He has too many to worry about it. I am sorry that Amazon has you by the throat. I guess that it makes you think twice about having the longer book. I SO enjoy reading the deeper detail that you give about many of the stories I already know. Keep on keeping on! You should run a poll on your blog, about what digital format readers would prefer. To see if its even justified to stick with Amazon. Because you can sell your own PDF for readers to download to their computers, if that's where the main section of the market prefer to buy their digital format. It's great to hear the updates on your critters, and I look forward to reading about your experience with raising your own pork. Like if you had to dispatch them yourselves or not. Some people prefer it that way, but most I read about, choose to use abattoirs. Barb thanks! I hope your bees do well. The cold is definitely a challenge for northern beekeepers' survival rates. I think pricing is always a conundrum - if it doesn't sell, you think you priced it too high, if it sells well you think you could have priced it higher, LOL. The lesson learned with Amazon is not to pin my hopes on what others may or may not do. That being said, I think Critter Tales is well priced, especially compared to other books of equal length and content. Value, of course, is highly subjective, so the key is being able to communicate to potential readers that they will get their money's worth. That's where book descriptions and reviews really help. I've tweaked the description on Amazon, so the quandary is marketing (which is where the facebook discussion comes in). I figure I am either providing goods or services, or making money. Most marketing is geared toward making money. I know a lot of folks wouldn't seen the difference between the two, but I think there is a big difference and it's reflected in honesty versus gimmicks and sales cliches. Well, I've considered other formats, which is why I'm doing an eBook version of The Little Series of Homestead How-Tos, to learn how to format for digital. For 5 Acres & A Dream The Book, the only digital format that would work would be PDF because of the maps and Master Plans. I did my own mobi version, but these were way too small to read on my Kindle (they're almost too small to see clearly in the 6"x9" print version.) Images are difficult on eReaders too, and drastically raise the cost of the final eBook. I've always been big on pictures, but I probably will cut back on that in the future if I keep on writing books. We mostly process our own animals because there are so few local processors with good reputations around here. The only one I know of is about an hour away but always booked up, so we haven't been able to get appointments. Then again, Dan says it keeps the "self" in "self-sufficiency," so it was something we knew we'd need to learn eventually. I just finished reading Critter Tales. It was excellent and, as I did with your first book, I will reread it and take notes. When creating art or anything for that matter, you must create it to your satisfaction. You write excellent books, you have a good following and anything you write will be well received. Keep on doing what satisfies you. Your house is looking nice. Unfortunately all outside work on our house has stopped until spring. But the way I look at it is that it gives me time to work on those inside projects. I'm waiting with great anticipation on the results of your wood ash experiment. It is something I never knew but think would be handy to know. Changing those windows up made a big difference to the appearance of your home. I really love what you and Dan have done to your house. Sorry to hear about your little drake disappearing. Hopefully, he will reappear?? What a nice looking speckled egg, I see many in your near future. Including eggs from your ducks. Duck eggs are great for baking of cakes, breads, pies, and cookies. Looking forward to your upcoming pig posts. Ed, Dan and I were laughing at ourselves the other day, because it seems that we always end up with the staining and painting parts in cold weather. You're right, though, there's never a shortage of indoor projects to occupy our time. so sorry to hear about your missing drake. I assume that when the ducks get nesting boxes that will include a roosting area? I started following your blog many years ago, five? six?...I took a long break from the internet due to illness and now that I've been back and reading up on your progress in the last few months, it's very motivating for me in particular who is heading to homesteading, and I'm so happy for you and your success. Kudos to you for being able to "do the deed"...I don't think I'd be able to do it, I even have a hard time "keeping" the fish when my bf and I go fishing! Sandy, the new windows have made an amazing difference. We are so looking forward to the day when the whole house is finished. I need to get another drake and have found quite a few on craigslist, but I need to build a duck shelter the ducks approve of. So far they like the pecan tree best! Yes, duck nest boxes with roosting area. Muscovies are considered tree ducks, even though they love their water. Rain! Welcome back. I'm so sorry you've been ill, but it sounds like you have made good progress toward health. Yes, we're still hanging in there on the homestead, although there are as many challenges and difficulties as successes. And Dan gets credit as deed-doer. Not sure if I could muster what it takes either! Have just found your blog and I look forward to a good look around! However right now it's time for a quick shower and off to work. Boooo! I'd love to stay right here by my wood stove for the morning, browsing through your older posts!